HSM SP4040s Strip Cut Shredder/Baler is one of the most innovative and unique product to have been introduced by HSM. This shredder/baler combination shreds paper and various other materials like USB sticks, credit cards and CDs/DVDs, and then bales the waste material into the relatively compact waste bin. This simple product saves users a lot of space and makes waste management and disposal quite easy. 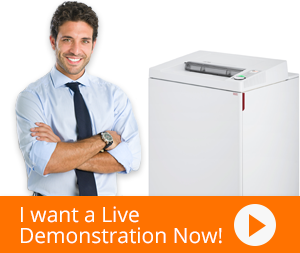 The shredder has a powerful continuous duty motor and can shred up to 130 sheets of paper at a time. The baler compresses up to 8 bales per hour. The SP4040s Strip Cut Shredder/Baler is also one of the most easy to use products. It consists of an electronic conveyor mechanism for feeding material, which makes it safe and efficient. Its JamStop technology prevents jamming inside the shredding unit, which is a massive assistance for those working in high volume work environments. The HSM SP4040s also has user-friendly LED indicators for functions like auto-stop and standby mode.